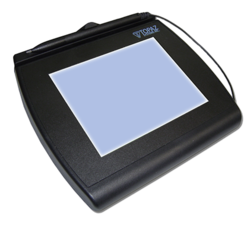 The rugged tablet series, the Topaz Systems SignatureGem LCD tablets, utilize electromagnetic technology, with an active pen, to reliably capture signatures for long-term use in commercial-grade applications. The 1x5 pad is for capturing signatures only. 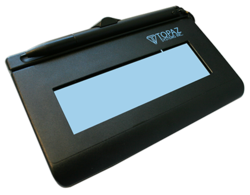 The 4x5 pad displays any number of text screens and acquires the signature on the last screen.